Intensive pear production systems use more than 1,000 trees/ha. They aim for early returns on capital and consistent high yields of good quality fruit from lower labour costs. Better labour efficiencies once established (e.g. more efficient harvest and pruning/training). Rootstocks play an integral role in influencing vigour, growth habit and cropping of the scion cultivar, resistance to pest and diseases and tolerance to unfavourable conditions in the growing environment. Profitability of an intensive pear orchard is initially dependent on how quickly new trees can be induced to set flowers and fruit. To realise the economic advantage of planting intensively, early cropping is essential. This is the integration of tree arrangement, planting density, support systems and training schemes. There is no one planting system to suit all situations. Factors such as soil, cultivar, rootstock, management regimes and socio-economic conditions will determine the optimal combination for each orchard. Excessive tree vigour can have a major impact on the productivity of a pear orchard and pruning will be necessary. Intensive pear systems require more efficient irrigation systems to maximise production with low water use. Decisions need to be made on the type of irrigation (e.g. drip vs. microspray) as well as whether the orchard uses Deficit Irrigation and when. Like irrigation, tree nutrition in intensive systems must be tightly controlled to ensure maximum productivity. The micro-environment of the tree canopy can change with different tree density and management systems and require suitable monitoring and control of pest and diseases. Deciding when to harvest pear fruit is not always straightforward, and can have a critical impact on fruit quality, ripening and storage behaviour. Nitrogen application in pear orchards. Fact sheet: discusses how to assess nitrogen status, calculate nitrogen requirements, fertiliser options and timing and method of applications. Evaporative cooling in apple & pear orchards - used to prevent sun damage of the fruit by applying overhead watering and lowering fruit surface temperature. Lexie McClymont (DEDJTR), Angie Grills (DEDJTR), Mark Hankin (APAL), Jenny Treeby (DEDJTR), Sophie Clayton (APAL), Ian Goodwin (DEDEJTR) and Sue Richards (DEDJTR). 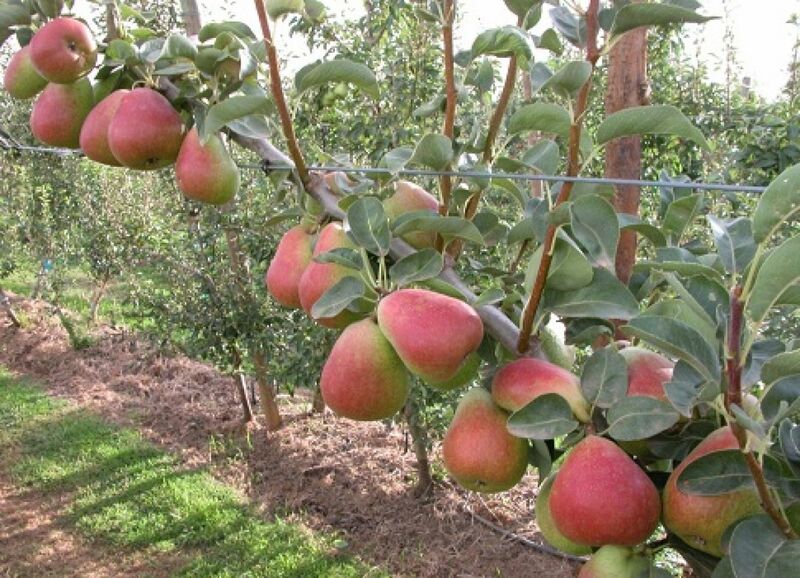 This resource was compiled as part of the Profitable Pears project, funded by Apple and Pear Association Limited (APAL), Horticulture Australia Limited (HAL) and Agriculture Victoria. First compiled in 2009, it was extended and updated in 2014. The information contained in this resource is for general reference only. Growers should seek local technical advice before deciding on changes to production and postharvest practices.